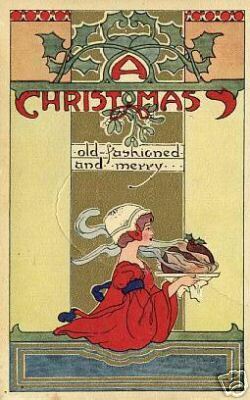 The Old Foodie: Vintage Christmas Recipes. I have enjoyed spending time reading your vintage recipes. You have an excellent site and I am so glad that Yahoo picked your site in it's weekly choice. Thanking you for taking time to bring pleasure to many. Thankyou Jill. I have had much pleasure myself in collecting the recipes. This is a really special collection! I'm very impressed; I love to see how people cooked in the "olden days". Thank you for going to all this trouble so that foodie nerds like me may be enlightened! The are offering a FREE eBook with whole lot of Recipes. You share some great recipes here. I cannot wait to try some of them out this Christmas season. Christmas Recipes are like priceless and I especially love that these are so old connecting the present and the past. I work with Better Recipes and I have to say that the recipes I love most are some of the ones that have been passed down from generation to generation. You have some great recipes here, thanks. I found this very informative. What fun to discover your blog and your books. A link was published on "thefreshloaf.com"...another wonderful resource. Thanks Embth! need to update the vintage recipes archive - lots of recipes have been included in blog posts, but not added to the archive - I am often too short of time to cut and paste or link them. !